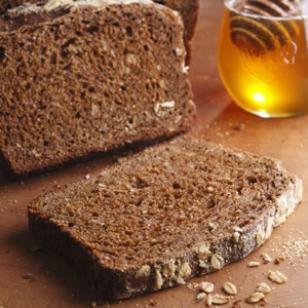 The flavor of this hearty, home-style multigrain bread is reminiscent of nice, bran muffins. It's great for toasting, making sandwiches or eating as is. Mix dough: Thoroughly stir 1 1/2 cups whole-wheat flour, bread flour, bran cereal, 1/3 cup oats, 1/4 cup cornmeal, salt and yeast in a 4-quart (or larger) bowl. Thoroughly whisk ice water, molasses and oil in a medium bowl. Vigorously stir the wet ingredients into the dry ingredients, scraping down the sides and mixing just until the dough is thoroughly blended. The dough should be moist and a bit sticky, but fairly stiff. If the mixture is too dry, stir in just enough additional ice water to facilitate mixing, but don’t overmoisten. If the dough is too wet, stir in just enough whole-wheat flour to stiffen slightly. Lightly coat the top with oil. Cover the bowl with plastic wrap. First rise: Let the dough rise at room temperature (about 70°F) for 12 to 18 hours; if convenient, stir once partway through the rise. For convenience (and improved flavor), you may refrigerate the dough for 3 to 12 hours before starting the first rise. Second rise: Generously coat a 9-by-5-inch (or similar large) loaf pan with oil. Vigorously stir the dough to deflate it. If it is soft, stir in just enough whole-wheat flour to yield a firm but moist dough (it should be fairly hard to stir). Transfer the dough to the pan. Lightly coat the top with oil. Smooth and press the dough evenly into the pan using a well-oiled rubber spatula or your fingertips. Sprinkle with the remaining 1 tablespoon each oats and cornmeal and pat down. diagonally in the top of the loaf. Cover the pan with plastic wrap. Let rise at warm room temperature until the dough nears the plastic, 1 1/2 to 2 1/2 hours. 15 minutes before baking: Position a rack in lower third of oven; preheat to 400°F. Bake, cool, slice: Reduce oven temperature to 375°. Bake the loaf on the lower rack until the top is lightly browned, 60 to 70 minutes. Continue baking, covering with foil if necessary to prevent overbrowning, until a skewer inserted in the center comes out with just a few crumbs on the tip (or until an instant-read thermometer registers 204-206°), 10 to 15 minutes longer. Cool in the pan on a wire rack for 10 to 15 minutes. Turn the loaf out on the rack and let cool to at least warm before serving. The loaf is good warm but slices best when cool. Make Ahead Tip: Wrap airtight and keep at room temperature for up to 3 days or freeze for up to 2 months. Note: Milled from high-protein wheats, bread flour develops strong gluten, resulting in well-risen loaves. It helps give breads with a high percentage of whole grains better structure and a lighter texture. Find it near other flours in most supermarkets. Tips: The easiest way to crush bran flakes is to put them in a small sealable plastic bag, close it tightly, then press down with a rolling pin or the palm of your hand. To prepare “ice water” for this recipe, add a heaping cup of ice cubes to cold water and stir for about 30 seconds before measuring out the water. You can turn your microwave into a warm, moist environment to help accelerate the second rise of the bread dough. Begin by microwaving 1/2 cup water in a 1-cup glass measure just to boiling. Set the water in one corner of the microwave, place the pan of dough on the other side of the turned-off microwave and close the door. The dough will double in size in 45 minutes to 11/2 hours. Per serving: 163 calories; 4 g fat (0 g sat, 1 g mono); 0 mg cholesterol; 30 g carbohydrates; 4 g protein; 3 g fiber; 275 mg sodium; 207 mg potassium. Nutrition Bonus: Iron (15% daily value). "Perfect. I used my breadmaker and this came out very light and tasty Ellen, Poughkeepsie, NY "
Join in and write your own page! It's easy to do. How? Simply click here to return to Healthy Breakfast Recipes. This is a great way to incorporate fruit into your french toast in a healthy and easy recipe. Slice some fresh bananas for a garnish on top and serve with fresh squeezed orange juice for the perfect breakfast. 1. Beat the banana, egg, egg white, milk and vanilla together in a small bowl. 2. Warm the oil in a large non-stick skillet over medium high heat. 3. Dip each piece of bread into the batter, turning them to coat both sides. Fry until brown on both sides. Serve with yogurt and fresh fruit, fruit syrup, etc.